Singapore has voiced enthusiasm for a huge regional trade pact that would include the most dynamic economies in Asia. But many influential civil society groups are concerned and have called for a better deal. Prime Minister Lee Hsien Loong said today he hoped the 16-nation Regional Comprehensive Economic Partnership (RCEP) could be completed by the end of the year. However, RCEP has stirred strong opposition from dozens of groups in Asian nations such as Thailand, the Philippines and India, who say it is a “secret” trade pact that threatens a wave of negative impacts, including undermining access to life-saving generic drugs. More than 80 people representing health networks, women’s groups, farmers, trade unions, academics, indigenous people and civil society groups met in Bangkok on July 20 to condemn the mega-trade pact. Medecins Sans Frontieres (MSF, Doctors without borders), which won the Nobel Peace Prize in 1999 for its health programs around the world, is among those who have voiced concern. It said if harmful intellectual property-right provisions were included in the trade pact millions of people in the developing world may be unable to get access to cheap life-saving drugs. “We urge the RCEP negotiating countries to think about the lives that hang in the balance if access to affordable generic drugs is shut down or blocked due to unjust trade measures,” said Leena Menghaney, MSF Access Campaign head for South Asia. Patent monopolies that prevent generic competition had led to dramatically high prices for new drugs to treat hepatitis C, tuberculosis and cancer, it said, putting pressure on health budgets even for high-income countries. A leaked text of the RCEP pact allegedly showed that Japan and Korea were pushing for provisions that seek to push for extended patent monopolies and “data exclusivity”, which it described as a form of marketing control to stop competition from generic drugs. Hundreds of thousands of Thais with HIV or AIDS rely on cheap generic drugs, and local activists fear that if the military government may also want to sign the trade pact. This raises the specter of large rallies in Thailand backed by many thousands of people with HIV/AIDS against RCEP if the Prayut government signs the deal without recognizing the groundswell of opposition it could provoke. Other groups that spoke out against the deal include Focus on the Global South and Public Services International. They said that RCEP could have impacts on half the world’s population. With the Trump administration having abandoned the Trans-Pacific Partnership (TPP), a rival trade pact, last year and now embarking on a unilateral, protectionist agenda, many states in Asia and the Indo-Pacific are now focusing on RCEP. The RCEP pact would group the 10 members of the Association of Southeast Asian Nations (ASEAN) plus China, India, Japan, South Korea, Australia and New Zealand. His remarks came soon after the US escalated a trade row with China on Wednesday by saying it was considering more than doubling threatened tariffs on a range of Chinese imports worth $200 billion. The US has already imposed 25% tariffs on $34 billion in Chinese goods, with another $16 billion to be targeted in coming weeks. 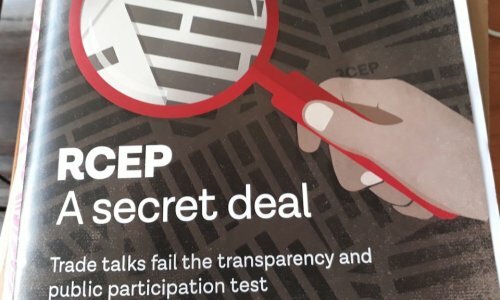 The RCEP has gained attention since the US pulled out of the TPP, which was billed as the world’s biggest trade pact when it was signed in February 2016 following years of negotiations. The 11 remaining TPP nations signed a slimmed down version of the agreement in March. But Beijing is now keen to use Washington’s rejection of that pact to build enthusiasm for its own deal and increase influence in the region.